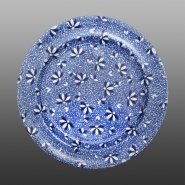 An example of a similar pattern produced by Spode named Leaf. It was common among competing factories to produce the same or similar patterns. This attractive chintz pattern was likely one of them. An earthenware coffee pot printed with an overall floral pattern and decorated with additional gilding. Whilst this piece is marked Wedgwood, the pattern is strikingly similar to Spode's pattern named Leaf, assigned number P.806 in Drakard, David and Holdway, Paul. Spode Transfer Printed Ware, 1784-1833. Woodbridge, Suffolk, Antique Collector's Club, Inc., 2002. See an example of Spode's pattern below.